Ramirez and FTC staff took questions from the media about the new site. Broadcast media, please also note that B-roll video is available on FTC.gov or by contacting the FTC Office of Public Affairs. 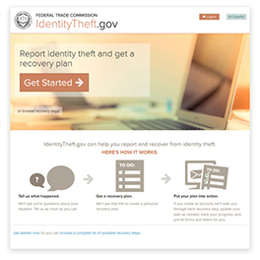 For the first time, identity theft victims can now go online and get a free, personalized identity theft recovery plan as a result of significant enhancements to the Federal Trade Commission’s IdentityTheft.gov website. The new one-stop website is integrated with the FTC’s consumer complaint system, allowing consumers who are victims of identity theft to rapidly file a complaint with the FTC and then get a personalized guide to recovery that helps streamline many of the steps involved. IdentityTheft.gov Homepage. You can download images or b-roll video of the new site. The upgraded site, which is mobile and tablet accessible, offers an array of easy-to-use tools, that enables identity theft victims to create the documents they need to alert police, the main credit bureaus and the IRS among others. "Identitytheft.gov is a vital resource as identity theft has reached epidemic levels," said Illinois Attorney General Lisa Madigan. "As most Americans know, we live in an age when it's not a matter of if, but when you will become a victim of identity theft. The FTC's website is a great place for consumers to go for practical and personalized help to recover from the financial mess created by identity theft." “Local law enforcement is often the first place identity theft victims turn for help,” said Mary Gavin, Chief of Police for Falls Church, VA, and an Executive Committee member of the International Association of Chiefs of Police. "IdentityTheft.gov will be a powerful tool to help police assist victims, and the information victims report to the FTC can help law enforcers build cases." In 2015, the FTC received over 490,000 consumer complaints about identity theft, representing a 47 percent increase over the prior year, and the Department of Justice estimates that 17.6 million Americans were victims of identity theft in 2014. The updated website provides a range of new features designed to make the recovery process as easy as possible for consumers. It now walks consumers through a simplified step-by-step checklist that is tailored to the specific type of identity theft they are facing. The advice consumers receive is not generic, but instead customized for their individual needs. When a consumer initiates a response plan through IdentityTheft.gov, the site will automatically generate affidavits and pre-fill letters and forms to be sent to credit bureaus, businesses, police, debt collectors and the IRS. Should a consumer’s recovery run into issues, the site will suggest alternative approaches. Once a consumer completes their initial report on the site, they will receive follow up e-mails and can return to their personalized plan online to continue the recovery process. IdentityTheft.gov is also available in Spanish at RobodeIdentidad.gov, and allows Spanish-speaking consumers to view the automatically generated letters and other documents in Spanish, but print them in English for sending to the relevant recipients. The upgraded site is the FTC’s answer to an executive order issued by President Obama in October of 2014 directing federal agencies to create a consolidated site with essential information for consumers. An initial version was launched in May 2015 with checklists for consumers based on certain types of identity theft. 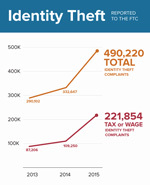 The FTC has produced a short video explaining how IdentityTheft.gov works for consumers. In addition to IdentityTheft.gov and the new personal recovery plan features, the FTC also provides extensive educational materials for consumers, businesses and law enforcement with information on how to prevent identity theft and remain vigilant for other scams.